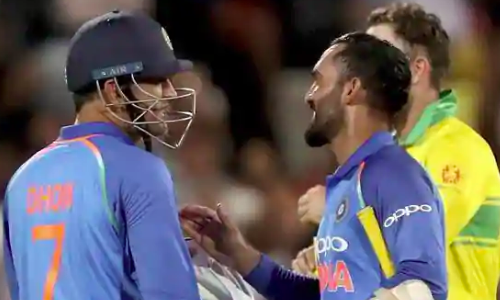 MS Dhoni rolled back the years by smashing an unbeaten half-century to help India win the second ODI against Australia and level the three-match series 1-1. The former India captain stitched a crucial 82-run partnership for the fourth wicket with skipper Virat Kohli (104*) before his 54-ball 55 helped the visitors chase down Australia’s 299-run target with six wickets in hand and four balls to spare. Needing 7 in the final over, Dhoni smacked a fullish delivery off Jason Behrendorff all the way over long on. And guess what? He failed to realize that he had completed his half century. Or did he? Well, Dinesh Karthik went up to him to congratulate and remind him of his feat, post which Dhoni did raise his bat – just a raise that he normally does. Meanwhile, the two teams will now lock horns in the series decider that will be held in Melbourne on Friday.